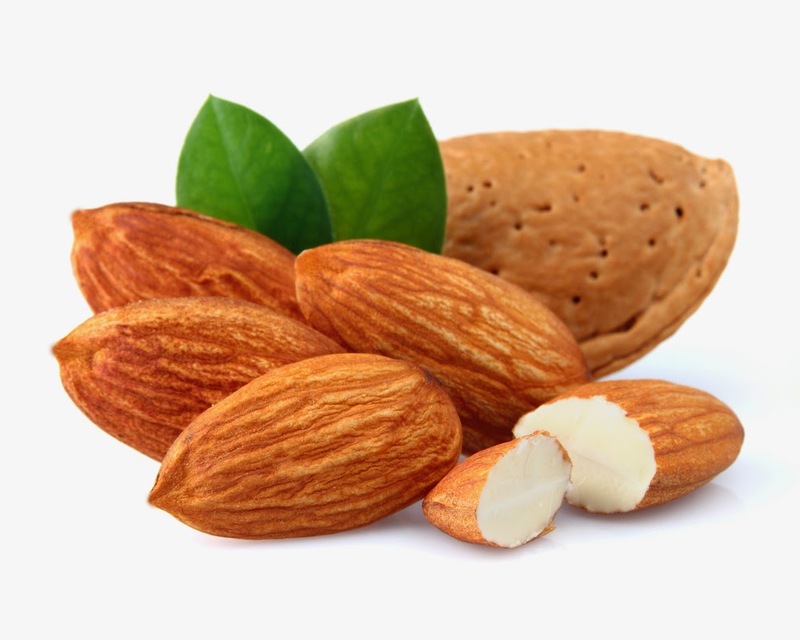 Almond nuts are rich in dietary fiber, vitamins, and minerals and packed with numerous health promoting phyto-chemicals. These nuts compose of well-balanced food principles that are essential for optimum health and wellness. Almonds are the complete source of energy as well as nutrients. The nuts, especially, are rich in mono-unsaturated fatty acids like oleic, and palmitoleic acids that help in lowering LDL or "bad cholesterol" and increasing HDL or "good cholesterol" in the human body. Research studies suggest that Mediterranean diet, which is excellent in monounsaturated fatty acids, help to prevent coronary artery disease and strokes by favoring healthy blood lipid profile. Almonds are a source of many nutrients which help in the development and health of the human brain. Almonds have been connected to a higher intellectual level and they have long been considered an essential food item for growing children. Studies have shown that almonds in the diet, as well as almond oil, is nutritive to the overall health and functioning of the nervous system. Almonds are great sources for alkali materials, and this is known to benefit the strength of the immune system, as well as increase the ability to stave off diseases and various health conditions. Almonds are rich in fiber, energy (good fats), vitamins, minerals, phytonutrients, and they are calorie dense. The fiber fills the stomach and regulates the speed digestion of the almond’s nutrients, and this helps clam hunger and the need to eat. Studies have shown that eating almonds and almond benefits support weight loss, gastrointestinal health, lowering cholesterol, inflammation reduction, and heart health. The nuts are an excellent source of vitamin E; hold about 25 g per100 g (about 170% of RDA). Vitamin E is a powerful lipid soluble antioxidant, required for maintaining cell membrane integrity of mucus membranes and skin by protecting from harmful oxygen-free radicals. Almonds are free in gluten, and therefore, are one of the popular ingredients in the preparation of gluten-free food formulas. Such formula preparations are, in fact, healthy alternatives in people with wheat food allergy, and celiac disease. Protection against diabetes: Almonds also help to reduce the reactionary rise in glucose and insulin levels after meals. This modulation offers protection from the dangerous spikes in blood sugar which diabetics often suffer from following a large meal, or a meal with an unexpectedly high level of sugar in it. Almonds are rich in fiber, and like most other fiber-rich foods, almonds help prevent constipation. However, it is also important to drink a significant amount of water when eating almonds to speed up the digestive process and beneficial effects of the nut. Use of almond oil is well-known for treating skin problems such as wrinkles, dark circles under eyes, dry skin, black heads, pimples and others. The oil is a prime ingredient in many massage oils. It leaves the skin soft, smooth and refreshed. Almond oil, extracted from the nuts, can be employed as an emollient. Applied regularly, it helps keep skin well protected from dryness. Additionally, the oil is used in cooking in Iran, and Turkey. It is also used as “carrier or base oil” in traditional medicines in aromatherapy, in pharmaceutical, and cosmetic industries.